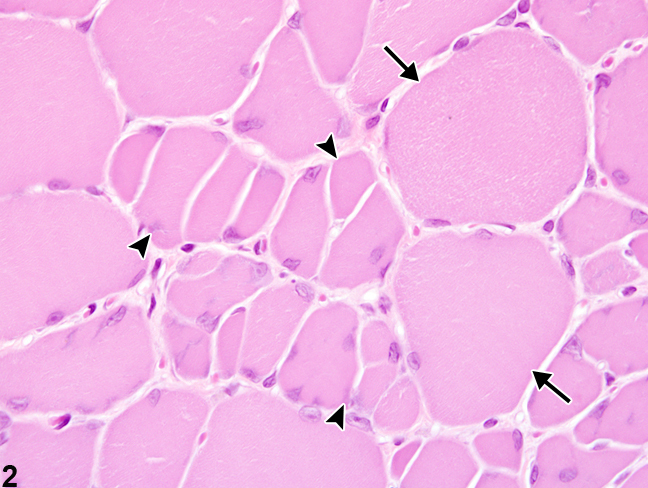 Skeletal muscle - Hypertrophy in a male Harlan Sprague-Dawley rat from a subchronic study. 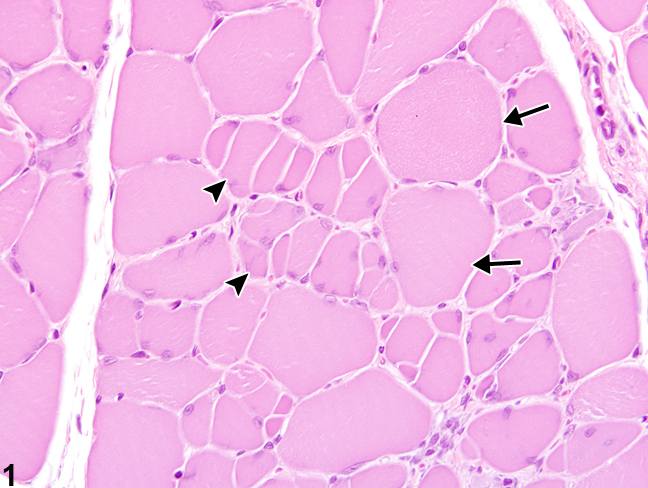 Large, hypertrophic fibers (arrows) are adjacent to longitudinally split muscle fibers (arrowheads). 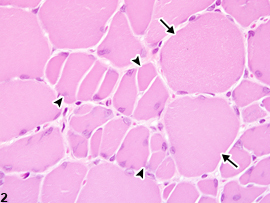 Skeletal muscle - Hypertrophy in a male Harlan Sprague-Dawley rat from a subchronic study (higher magnification of Figure 1). 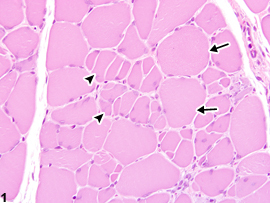 Large, hypertrophic fibers (arrows) are adjacent to longitudinally split muscle fibers (arrowheads). Skeletal muscle hypertrophy is characterized histologically by an increase in myofiber diameter. This can sometimes be difficult to detect histologically. Hypertrophy occurs as a result of increased workload and can occur either focally, as a compensatory reaction following the loss or atrophy of surrounding muscle, or more extensively, as a physiologic response to increased exercise demands. In addition, diffuse hypertrophy can occur in response to prolonged exposure to excessive growth factors, such as growth hormones or growth-promoting xenobiotics. Myofibers undergoing compensatory hypertrophy due to a myopathic or neuropathic disorder can reach diameters up to twice that of fibers that have undergone physiologic hypertrophy. These fibers are often abnormal and can contain one or more internal nuclei, undergo longitudinal splitting ( Figure 1 and Figure 2 ), and/or exhibit bizarre cytoarchitectural alterations, such as clefting and whorling. In these instances, individual hypertrophic myofibers are often interspersed among atrophic ones. Whenever present, hypertrophy should be diagnosed and graded. When hypertrophy occurs within an area of atrophy, it should not be diagnosed separately unless warranted by severity. Greaves P. 2007. Musculoskeletal system. In: Histopathology of Preclinical Toxicity Studies, 3rd ed. Elsevier, Oxford, 160-214. Greaves P, Seely JC. 1996. Non-proliferative lesions of soft tissues and skeletal muscle in rats, MST-1. In: Guides for Toxicologic Pathology. STP/ARP/AFIP, Washington, DC. Valentine BA, McGavin MD. 2007. Skeletal muscle. In: Pathologic Basis of Veterinary Disease (McGavin MD, Zachary JF, eds). Mosby Elsevier, St Louis, 973-1040.